About the time this photograph was taken, the sculptor Maniglier (1826–1901) was among the artists selected to execute the monumental sculptures that ornament Napoleon III's grandiose new Louvre. Exhibiting in the Salons of 1856, 1863, and 1868, Maniglier was also commissioned to carve an allegorical relief, "Science" and "Art," for Charles Garnier's Opéra, the last extravagant public building designed for the capital of the Second Empire. 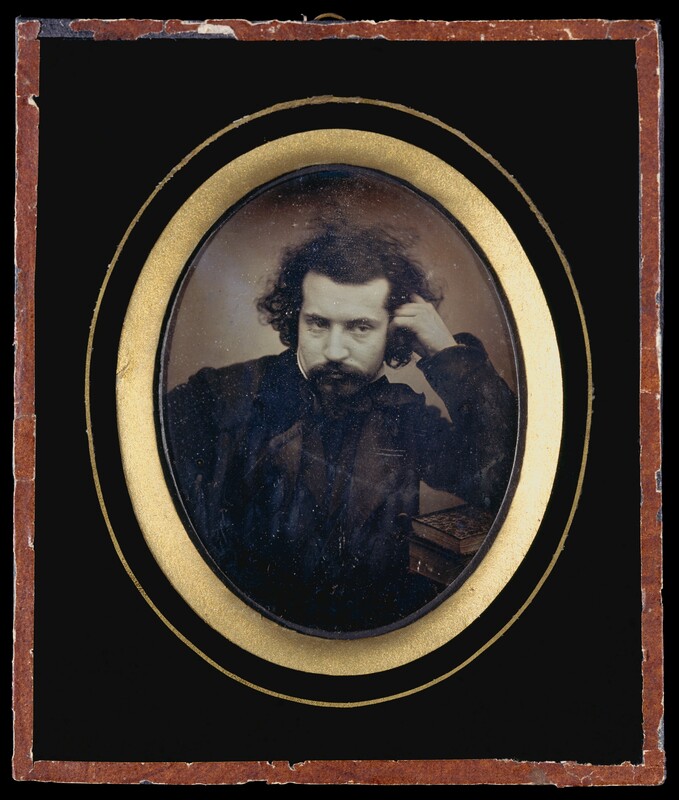 The portrait of Maniglier is a daguerreotype, the first form of photograph, invented by Louis Daguerre in 1839. Immediately popular for portraiture, the daguerreotype was all the rage in Paris until paper photography replaced it in the mid-1850s. Unlike many daguerreotype portraits, which are emotionally cool and stiffly posed, this one projects an immediate physicality and strong three-dimensionality quite appropriate for the sculptor. By posing Maniglier with his head on his hand, brooding intently beneath a tousled mane of hair, the photographer further suggests that Maniglier is an artist of the Romantic school, one with an intense sensibility given over to a passionate imagination. The photographer so successfully conveys the concentrated energy coursing between Maniglier's temples that one senses the dualism of creativity, which is part curse, part salvation—the horns and halo of the modern artist's self-image. The Metropolitan Museum of Art. "Photographs: A Decade of Collecting," June 5, 2001–September 4, 2001. The Metropolitan Museum of Art. "Portraits: A Century of Photographs," September 10, 2002–January 13, 2003.